The DP1001AM is 10 channel temperature scanner for thermocouple inputs. Channels can be manually or automatically scanned and active zones are displayed on the large, backlit, liquid crystal display. 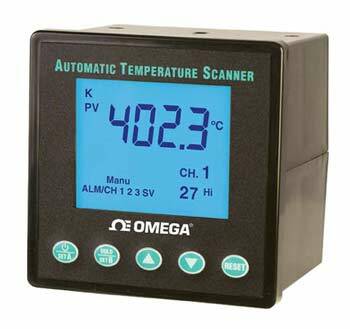 The scanner is programmable for J, K, T or E thermocouple types, °C or °F, and scan rate between 2 to 60 seconds. Each channel has individual, independent and programmable alarm setpoints with alarm indicator. Memory and setpoints are retained when power is off. The RS232 communications (2 wire set up, Transmit only) can monitor up to ten channels and software is included with every unit. A single output latching form C relay is provided to activate for an alarm condition on any zone. The instrument shows alarm condition for each channel on the LCD. The alarms are latching and are reset manually from the front panel.